SCO19 is the Metropolitan Police Service's (MPS) specialist firearms unit. This elite cadre of highly-trained police officers are on standby to respond to any armed incident in London. Both men and women can join SCO19. SCO19 has around 550 members, including training staff, TST, CTSFO and ARV units. SCO19 was previously CO19, before that SO19. The Janaury 2012 merger between the Central Operations and Specialist Crime Directorate (SCD) branches to form Specialist Crime & Operations (SC&O) resulted in the unit's current designation of SC&O19 / SCO19. Armed Response Vehicle, or 'Trojans' respond to spontaneous incidents involving firearms. 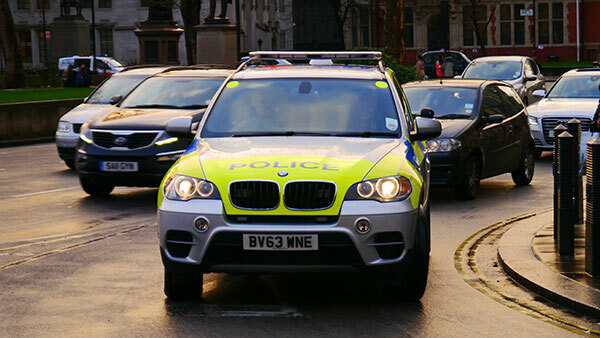 To enable fast pursuit and arrival times, BMW cars, fitted with state-of-the-art satellite navigation and communications gear are the vehicle of choice for the ARV teams. ARVs will patrol known trouble areas, waiting to move in when needed. ARV units are usually crewed by 3 Armed Response Officers: driver, communications operator and observer/navigator. ARV officers are armed with Glock 17 pistols as standard. They also carry tasers. 2 x Heckler & Koch (H&K) MP5SF 9mm carbines and 2 x H&K G36C(SF) carbines are secured in a gun safe inside the ARV. Also carried is a H&K L104A12 37mm projectile launcher, along with various baton rounds. Bulletproof riot shields, a red enforcer battering ram, hoolie tool (crowbar) and specialist first aid kits may also be carried in the ARV's boot. A BMW X5 Xdrive30d Armed Response Vehicle drives through London traffic. 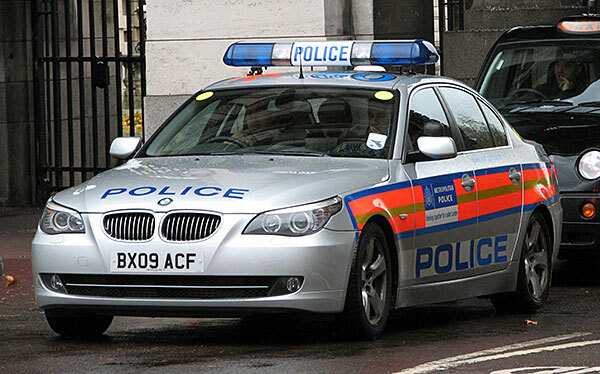 SCO19 and the Diplomatic Protection Group have moved away from the 5 series vehicles for ARV use. One of the reasons for the change was that the X5's suspension is better able to deal with the additional weight from all the equipment carried (gun safe, shields, radio gear). Trojan Proactive Units carry out high visibility ARV patrols in crime hotspots, in an effort to deter criminal activity. This is a relatively small unit, comprising some 24 officers split into 2 teams. TPU Officers have been seconded from regular ARV duty. Tactical Support Teams (TST) consist of experienced ARV officers trained to provide support to other Met units. TSTs are a more proactive SCO19 element i.e. they tend to carry out authorised, pre-planned, intelligence-led operations. These may include performing high-risk arrests and raiding criminal establishments were the presence of firearms is suspected. They may be deployed as armed backup for operations by specialist Met units such as the Flying Squad and surveillance units. TSTs operate in both overt (uniformed) and covert (plainclothes) profiles. Before the creation of TSTs, SCO19 consisted of ARV units and teams of Specialist Firearms Officers (SFO) (now CTSFO). TSTs freed up the SFOs from some operations. In terms of training and capabilities, the TSTs fall between the ARV and CTSFO teams. Specialist Rifle Officers are experienced AFOs who have been trained to use sniper/marksman rifles. They deploy rifle teams in support of SCO19 pre-planned operations, typically setting up overwatch at vantage points overlooking an incident. Rifle team weapons include scoped H&K G3K semi-automatic rifles. CTSFOs are another proactive element of SCO19. Their role includes counter terrorism and hostage rescue. Like TSTs, CTSFO teams provide firearms support to other Met specialist units and may operate in both an overt and covert manner. CTSFO teams are on standby to respond to a terrorist or major crime incident both in London and at the National level. CTSFO units may be called to storm buildings, planes, buses, trains and boats, both docked and underway. These operations requires that CTSFOs receive a higher level of training than the Tactical Support Teams. Like TST Officers, CTSFOs have served as ARV Officers before going through their own extensive selection and training process. 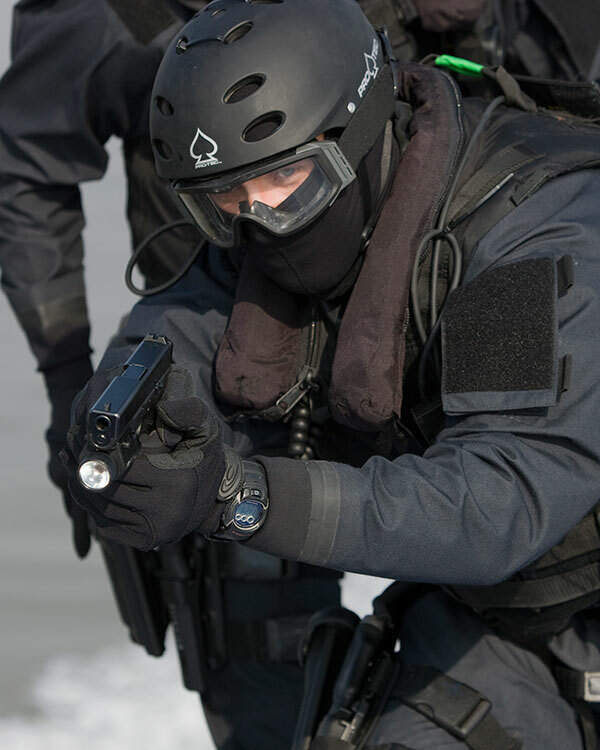 A SCO19 CTSFO armed with a Glock 17 pistol during an Olympic security practise drill. The CTSFOs have just boarded a vessel on the Thames river and so are wearing a dry suit and life jacket. They are also weaing Pro-Tec ballistic helmets. In recent years, SCO19 has developed a fast-rope capability which enables CTSFOs to be deployed by helicopter. 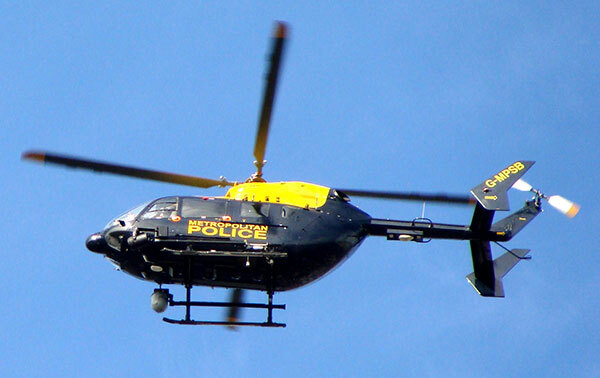 The Met's Air Support Unit operates 3 Eurocopter EC-145 helicopters. These aircraft have been certified for fast-rope operations by the Department for Transport (DfT) . The EC-145s carry a sensors package which includes a Wescam MX-15 electro-optical turret. Feeds from MX-15 can be beamed down to SCO19 commanders on the ground during an operation, greatly adding to their situational awareness. A Eurcopter EC-145 - 1 of 3 operated by the Air Support Unit. SCO19 CTSFOs can deploy via military-style fast-rope insertion from these helicopters. The Wescam L-3 MX15 sensor pod is visible as a white dome hanging from the right fuselage. SCO19 is provided marine support by the Met's Marine Police Unit (MPU). Among its other roles, the MPU operates a small number of Delta 1000TX rigid inflatable boats (RIB). These boats, which can reach speeds of 50 knots, are used to transport SCO19 teams along the Thames River network. This may done to circumvent gridlock on the city's roads, approach an objective on the river-side or board a vessel (both berthed and underway). During the run up to the 2012 Olympic Games, SCO19 practised boarding vessels on the Thames (see photo below). SCO19 CTSFOs race along the Thames on a RIB piloted by the Marine Policing Unit.